Time for CAS(E) This Sketch Challenge #13! I did exactly what you should not do when looking at a sketch challenge. I got hung up on that little shape in the top right corner. 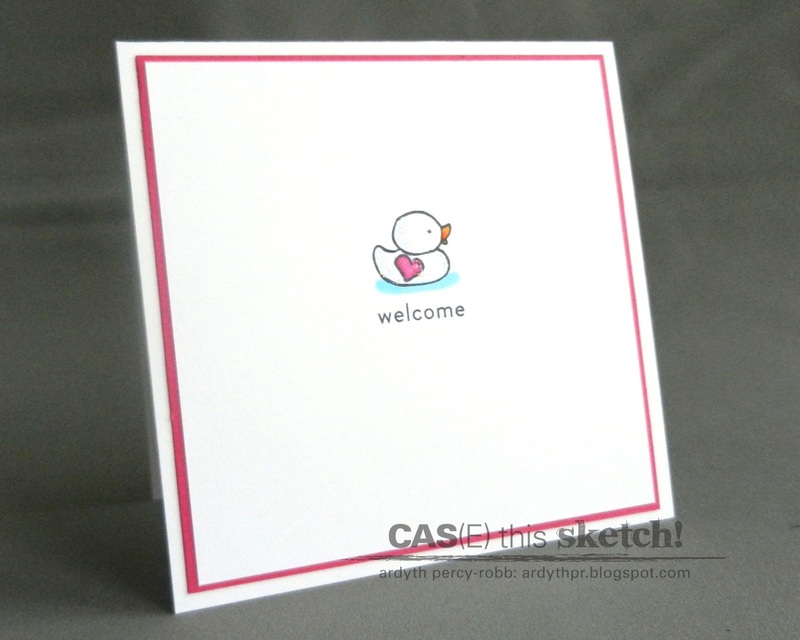 I saw it as a duck's bill and could NOT convince myself otherwise, so here's my little ducky baby card. I used a Stampin' Up duck stamp, but masked his wing, so that I could stamp it as a heart. There is a tiny bit of sparkle on the duck, which I achieved by applying Stickles and then placing my finger on top to remove most of it. Now it's your turn - I can't wait to see how you interpret this sketch. Don't get hung up on the shapes like I did! a very clever interpretation Ardyth!! It's adorable - I see the duckbill too, now you come to mention it! Now that's very creative!! I love the little heart made from it's wing. This is so sweet! Love your interpretation of the sketch. The heart and the bill for the duck...perfect! As if I can see the sketch any other way now! :P Too funny, and so cute. Now all is see is a duck's bill. LOL Your card is adorable! ooooohh! This is such a FUN take on the sketch and I can really see what you have focused on, it's wonderful Ardyth! I love this super sweet card. Funny how you came to this design and although the sketch is hardly recognizable anymore, the resulting card is more than great! So adorable, Ardy! I love how you don't fight against whatever your imagination inspires you to do. You trusted it and it did not let you down! Hahaha ... you're right, what else could this be BUT a duck?! LOVE the sentiment font/size! love the way your mind works, ardyth... your card is so cute! Ha ha! I LOVE IT! It's so nice to read your interpretation and it totally makes me smile! Could I please borrow your brain for a day or so?? I love how you see things in such a fabulous and unique light!